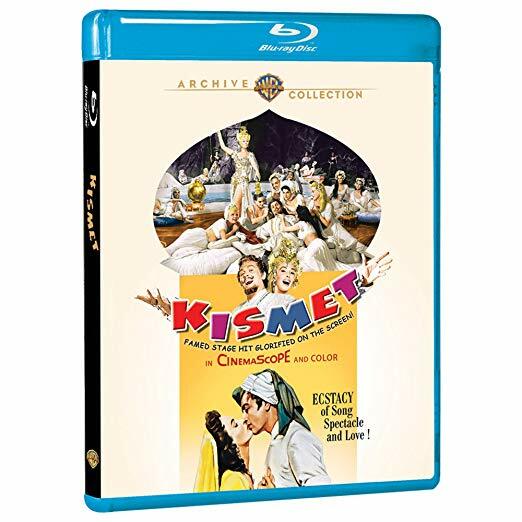 The idea of making a musical which takes place in Baghdad would be a non-starter in the 21st Century, but it made perfect sense when Kismet was released by MGM in 1955. The story had actually been filmed as a drama several times before, the first being a silent movie which was made in 1920. Subsequent versions included an MGM romantic drama in 1944 which starred Ronald Colman and Marlene Dietrich. Kismet was turned into a hit Broadway musical in 1953, where it ran for 583 performances, featuring music adapted from the works of Russian composer Alexander Borodin. 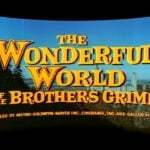 The success of the Broadway show inspired MGM to make a lavish Cinemascope musical, which has now been released as a gorgeous Blu-ray by Warner Archive. As dawn breaks in Baghdad, Hajj (Howard Keel) and his daughter Marsinah (Ann Blyth) awake in a stable for camels, where they have been sleeping on a pile of hay. Hajj ekes out a bare subsistence living by making up rhymes for people who are shopping in the marketplace, but on this morning he and Marsinah do not even have money for breakfast. As the morning progresses Hajj accidentally discovers that begging is more profitable than rhyming. He has a sharp mind and a quick wit, attributes which serve him well in what proves to be a momentous day.Hajj’s-found luck takes a turn for the worse when, due to a case of mistaken identity, he is kidnapped and taken to the desert to be confronted by Jawan (J.C. Flippen), a robber and brigand. Jawan believes that Hajj had, years earlier, placed a curse upon him and caused him to lose his son, whom Jawan had not seen since the boy was very young. Hajj cleverly turns the tables by telling Jawan that he will cancel the curse and guarantee that he will find his son that very day if he pays Hajj a hundred pieces of gold. In the course of a few hours Hajj goes from being penniless to a possessor of great wealth.Meanwhile, back in Baghdad the Wazir (Sebastian Cabot), the polygamous chief law enforcement officer of Mesopotamia, greets his first wife Lalume (Dolores Gray), who is returning from a mission to the northern province of Ababu. The Wazir is in need of gold, and he sent Lalume to Ababu to negotiate a loan. She reports that the Sheikh of Ababu is prepared to loan the Wazir “all the gold ten camels can carry,” but there is a catch. In return for the loan, the Sheikh wants the Wazir to arrange for the marriage of his three daughters to the Caliph of Baghdad (Vic Damone).The young Caliph has been in mourning for a year following the death of his father, and he is now ready to assume his duties as the ruler of Mesopotamia. He has been circulating among his subjects incognito to get the pulse of the people and he is prepared to return to his palace. However, as he walks through the marketplace with his servant Omar (Monty Woolley), his eyes capture a glimpse of Marsinah, and for the Caliph it is love at first sight. However, he loses her in the crowd, and when she catches up with her father she learns that he now has more money than they had ever dreamed of. Hajj celebrates by turning Marsinah loose on a shopping spree, which gives Ann Blyth the opportunity to sing “Baubles, Bangles, and Beads.” Hajj then buys a house for them and several female slaves for himself.The Caliph finds Marsinah and follows her to the new home. She initially brushes him off, as she is unaware of his true identity and mistakenly believes that he is a common gardener. However, he wins her over when he sings the film’s signature tune, “Stranger in Paradise,” which evolves into a duet by Vic Damone and Ann Blyth. By 1955 Damone was already an accomplished recording artist with four solo albums to his credit, and Frank Sinatra famously declared that he had “the best pipes in the business.” Damone reportedly turned down the role of Johnny Fontane in The Godfather because he felt that the character was disrespectful to Old Blue Eyes.The Caliph returns to his palace and declares that he has found the woman who will be his wife, an announcement which sends the Wazir into a state of despair because he will not get the gold that he needs if the Caliph does not marry the daughters of the Sheikh of Ababu. A series of amusing twists and turns involving Hajj and Marsinah ensues.MGM spared no expense in making Kismet, and it shows. Director Vincente Minelli had already worked on such musical hits as Meet Me in St. Louis, An American in Paris, The Band Wagon, and Brigadoon (parts of Kismet apparently were directed by Stanley Donen, who received no on-screen credit). Howard Keel exudes charm and exhibits a booming baritone voice as Hajj, and Ann Blyth is lovely and displays a fine singing voice. Dolores Gray is suitably wily as the seductive Lalume, and the corpulent Sebastian Cabot is menacing as the treacherous Wazir. The character of the Caliph is not well-developed, but Vic Damone shows why Sinatra loved his voice with his performance of “Stranger in Paradise.” The supporting cast is universally excellent.A couple of trivia notes about Ann Blyth – she was born in the same hospital as me in Mount Kisco, N.Y., and as a teenager she was discovered for Universal Studios by director Henry Koster, the grandfather of Home Theater Forum reviewer Kevin Koster. Kismet was filmed in the always-problematic Eastmancolor, but Warner has done a superb job of restoring it to its original glory. The colors are vivid and accurate and there is not a hint of age-related damage to be seen. Readers of this review are encouraged to check out the high praise bestowed upon this Blu-rayby our resident expert, Robert A. Harris. The 5.1 DTS-HD MA audio is the equal of the picture quality. The instrumental version of “Stranger in Paradise” which plays over the opening credits fills up the room, and the rest of the film’s musical numbers receive the same outstanding treatment. Dialogue is confined to the center channel and it is clear, understandable, and free of noise or distortion.English SDH subtitles are available for those who need them. There are number of enjoyable extras on this Blu-ray release. They are shown in standard definition but all of them are watchable, although not always in exemplary condition.First up is a letterboxed, non-anamorphic version of The Battle of Gettysburg, an Academy Award-nominated documentary short which was released in 1955 and is narrated by Leslie Nielsen. The film was made entirely on location at Gettysburg. The transfer unfortunately displays a considerable amount of jiggle and video noise, but the elements are in good shape and it is watchable. It has a running time of just under 30 minutes.The First Bad Man is a Technicolor cartoon from 1953 by Tex Avery. It tells the story of Texas in prehistoric times, where the peace is ruined by the notorious Dinosaur Dan. The cartoon is narrated by Tex Ritter. It is in very good shape, with reasonably vivid color and fine sound.Two “MGM Parade” promotional shorts about Kismet are in black & white and are hosted by George Murphy.Of particular interest is a partially deleted outtake of the song “Rahadlakum” which is performed by Howard Keel and Dolores Gray. I can only assume that the censors deemed this introductory part of the song to have been excessively risqué, because it takes place in the Wazir’s harem and appears to be mocking the concept of virtue. The outtake portion is letterboxed in black and white and has a couple of moments where the picture has some damage.There also is an audio outtake of the song “Rhymes Have I,” sung by Howard Keel. 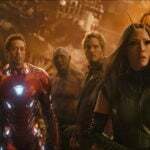 The song obviously was intended to be part of the first scene but ultimately was not used. The audio outtake is in superb condition.The theatrical trailer for Kismet is letterboxed in standard definition. 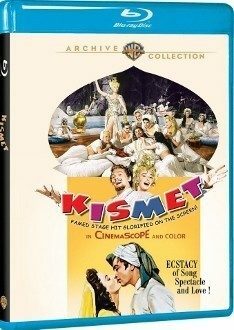 Howard Keel introduces various scenes from the film.Finally, there is the color trailer for the 1944 version of Kismet, which is available on DVD from Warner Archive. Kismet has never been as highly regarded as some other MGM musicals of the fifties, but it is an enjoyable romp thanks largely to an exuberant performance by Howard Keel and excellent singing by Ann Blyth, Vic Damone and Dolores Gray. The Warner Archive has done a superb job of bringing the film to Blu-ray with a magnificent transfer and outstanding sound. It can be purchased directly at the Warner Archive website. I have to give Warner Archive great thanks and tremendous respect for the care it has given to the musicals it has released. Gypsy, Billy Rose's Jumbo, Hit the Deck, and now Kismet have all featured spectacular picture and sound. I can only hope that we'll get more gems from the MGM musical library through this extremely worthy and much appreciated alternative to Warner Home Video. I agree totally.This blu ray presentation is spectacular! Kismet was never one of my favorites until now as this transfer gave me a whole new appreciation for this film. I strongly recommend picking this up along with the other titles Matt mentioned in the above post in support of WAC, so they'll continue to release other gems from the vault to rediscover in a whole new light. There is a kind of splendor in the production design….not gaudy, no…even a little sparse. The "Night of My Nights" number is both beautiful and economical in the numbers of people who actually make up the processional. The icing on this musical cake is the splendiferous conducting/arranging by Andre Previn of the classical-turned-Broadway-musical score and the sumptuous orchestrations of Conrad Salinger. If only Fox would give the same kind of loving attention to its MOD program! I don't have the Blu-ray yet, and there haven't been any screen caps posted anywhere, but I believe Kismet is presented in its original 2.55:1 aspect ratio, as was the DVD. I've just started watching my blu-ray of this wonderfully silly 1955 movie again. Amazing restoration of this colorful and tuneful bit of Hollywood cotton candy. From the review…. Kismet has never been as highly regarded as some other MGM musicals of the fifties, but it is an enjoyable romp thanks largely to an exuberant performance by Howard Keel and excellent singing by Ann Blyth, Vic Damone and Dolores Gray. The Warner Archive has done a superb job of bringing the film to Blu-ray with a magnificent transfer and outstanding sound." PS The CinemaScope lenses for this movie are better than those for movies of just a year before. No CinemaScope "mumps". What an good director Vincente Minelli was. I've seen several of his movies, but several others I've missed…. 1943 Cabin in the Sky: ?? I don't think I've seen this one. 1945 Yolanda and the Thief: ?? Haven't seen it, but apparently it has some very surreal musical numbers with Fred Astaire. 1946 Undercurrent:?? A film noir starring Katherine Hepburn and Robert Mitchum? Sign me up. Apparently this movie was a big hit. 1948 The Pirate: A- Wow! Really fun. 1949 Madame Bovary: ?? I don't think I've seen this one. 1950 Father of the Bride: B A great cast has some good moments, but not quite my cup of tea. 1951 An American in Paris: A+ His greatest film. 1952 The Bad and the Beautiful: A- Very good behind-the-scenes Hollywood drama. Not quite Sunset Blvd, but really good. 1953: The Band Wagon: A- Really fun. 1954 The Long, Long Trailer: B+ Fun when I saw it 40 years ago. I Love Lucy on wheels? 1954 Brigadoon: B+ Surreal and silly, but worth the trip imho. 1955 The Cobweb: A I love this fast-moving mental health drama! I wish it could be restored. 1955 Kismet: B+ Really silly. But fun. 1956 Lust for Life: A- This movie is slow but very good. 1956 Tea and Sympathy: B Flawed but somehow still kind of good. Censorship means that the main point of this story may have been lost. 1958 The Reluctant Debutante: ? 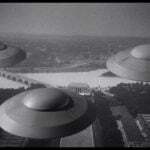 1958 Some Came Running: ? 1960 Home From the Hill: ? 1960 Bells Are Ringing: ? 1962 The Four Horsemen of the Apocalypse? What the heck is this one? 1962 Two Weeks in Another Town: ? Apparently butchered by the studio? 1963 The Courtship of Eddie's Father: ? Glenn Ford and Shirley Jones! 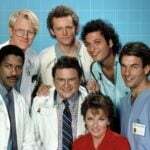 I saw the later tv show when I was a kid. I love this surreal Barbra Streisand musical. Wow. I've missed more than a dozen movies from one of my favorite directors. I wish someone would put out a boxed set of his movies, but since that's not going to happen I guess I need to rent the ones I can find from amazon. Purely personal opinion, but I find his 'Meet Me in St Louis' and 'Gigi' his masterpieces. The first has a very good Blu ray transfer .. 'Gigi' is acceptable but could be a lot better. I'm hoping for a better transfer one day down the track. Thanks for the hard work in compiling that list. It shows what an important player Minelli was. Does anyone know if the cut sequences from On a Clear Day survive? I wonder if this is a movie that Criterion would consider doing? If ONLY Robert Goulet had been cast as the psychiatrist instead of Yves Montand. To hear those songs sung in his powerful and caressing baritone would have been swoon-worthy. For me, Montand practically ruins the movie. Thanks for that list. I never realised this before but there's only one film of his I haven't seen: I Dood It. If you feel like it, I'd be interested to hear your thoughts and/or ratings of the films. Do you have any favorites in the post Gigi period, for instance? I've seen almost none of those. And from back in the 1940s what is Yolanda and the Thief like? Minnelli had many big hits throughout his career, but Kismet wasn't one of them. With a fairly lavish budget for the time of more than $3 million, Kismet's modest box office resulted in lots of red ink for MGM in 1955. From wikipedia…. "According to MGM records the film earned $1,217,000 in the US and Canada and $610,000 elsewhere resulting in a loss of $2,252,000." Amazingly, Minnelli directed another big movie in 1955, the totally different mental health drama The Cobweb, starring Richard Widmark, Lauren Bacall, Gloria Grahame, Charles Boyer, etc. Has anyone else seen this one? I really like it. 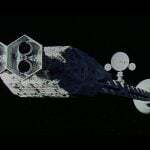 But even budgeted at $2 million, this was another expensive flop once advertising and overhead costs were included. From wikipedia…. "According to MGM records, the film earned $1,385,000 in the US and Canada, and $593,000 elsewhere, resulting in a loss of $1,141,000." My appreciation for/frustration with Yolanda and the Thief has always been a double-edged sword. On the one hand, it is imbued with Minnelli's exquisite palette of Technicolor – a fantasia that, at times, almost seems to favor the gaudy tone of a 2oth Century-Fox musical, rather than one made at MGM. Also, it has some of the most stunning set design of any musical made at Metro. Just look at Bremer's absurdly surreal – and wonderful – bathroom, or the magnificent B&W squiggle tiled floor for 'Coffee Time', which really heightens the equilibrium-offsetting electricity of Astaire and Bremer's dance number. Pure Minnelli. Pure Metro-Goldwyn-Magic! But the chemistry between Fred Astaire and Lucille Bremer just isn't there. Bremer, who is undeniably gorgeous to look at, is glacial cool and never really warms to Astaire's advances. Worse, the story is a rather sickening take off of the vignette Astaire and Bremer played from Ziegfeld Follies – a con artist out to take advantage of a naive young rich girl. Herein, the ruse is further complicated by Bremer believing that Astaire is her guardian angel, sent from heaven. Therefore, any love affair just seems to be severely screwing with the space/time continuum and the laws of man and God. Of course, they get together at the end, after Bremer gives her head a good shake and realizes Astaire is, in fact, mortal. Finally, for a musical in general, and one made at MGM in particular, the score is lousy. There are only 5 songs here, and all of them are forgettable. 'Coffee Time' is the best executed and really gives Astaire a chance to show off. His ballad, 'Yolanda' is melodic, and Astaire, of course, acquits himself nicely of its easy-going lyric. But singing of romantic love when you are supposed to be 'an angel' is about as unromantic a premise as you can get – and doing it on a harp, no less. In spite of all this, I own and frequently watch Yolanda and the Thief. It's a gorgeous film to look at if you don't care about plot, and it would make a very fine Blu-ray release from WAC, as the DVD from them looks as though it has had some restoration work done to revive its Technicolor palette. Otherwise, it is a footnote in Minnelli's career. Thanks, Nick, for that detailed and perceptive review. Did they get a song out of it for one of the That's Entertainment movies? Or maybe there's one lurking on youtube. Anyway, with all the good Minnelli movies out there that I still haven't seen, this seems like maybe one for me to skip for now. Two Weeks in Another Town from 1962 was released by Warner Archive last year on blu-ray. Apparently the studio cut major stuff out of this movie before release, but the footage must be lost since it wasn't included on the blu-ray. I can't find a review of this blu-ray here, but it seems like it's a not very successful return to the behind-the-scenes of movie-making subject. I often append very brief opinions about films in various threads but I don't regard myself as a reviewer. I don't split Minnelli's work into pre and post Gigi and I don't have a favorite period but you're missing out if you don't familiarise yourself with his later films..
Yolanda And The Thief is essential viewing for anyone who loves musicals and anyone who is interested in the "look" of films. The dancing is excellent and Lucille Bremer is one of the two most vivacious female dancers in movies. The other of course being Rita Hayworth. The story line does not appeal to everyone which is why the film does not have a major following but I would not be without my DVD-R of this film. I'd love Warner Archive to release this on Blu-ray disc. Kismet is a clunker. The best thing about it is the score and Dolores Gray. But Minnelli, who obviously directed it under duress and wanted, rather impatiently, to get on with shooting Lust for Life, just seems to be throwing away a golden opportunity here to make the most out of an obviously lithe and lyrical stagecraft that, unfortunately, remains stage bound in its execution. Just look at 'Night of My Nights' that Minnelli simply lets run, with a parade of extras running past his stationary camera. It's as though he just wants to stick it to Metro for forcing him to accept this assignment. There's no splash or flare to any of it. The musical sequences ought to have been expertly choreographed. Alas, not since Nineveh – and never to be here. The gorgeous Andre Previn/Conrad Salinger orchestrations, and sumptuous E. Preston Ames production values are utterly wasted on flatly executed production numbers and even more static 'dramatic' sequences that Minnelli shoots as though this were his first flick utilizing Cinemascope. Minnelli didn't like 'scope' as a mode of presentation but proved he knew damn well how to use its elongated screen proportions to perfection elsewhere in his picture-making prowess. So, his lack of wherewithal on Kismet isn't a case of a novice doing his best, but a master craftsman woefully disinterested in doing any better. Kismet is one of those truly missed opportunities for me, because I absolutely adore the score, and am a big fan of Dolores Gray, Howard Keel, and, Vic Damone – all sounding spectacular in stereo. But the movie tanks completely on Minnelli's lack of verve for the material. This one ought to have been assigned to some other director because it hopelessly lacks any of Minnelli's trademark touches to define itself as one of his best. Coffee Time is featured in That's Entertainment Part III. 1958 The Reluctant Debutante – erudite rom/com with the superb Rex Harrison and ill-fated Kay Kendall – the Carol Lombard of her generation. 1960 Bells Are Ringing – although lacking Minnelli's touches, Judy Holliday's comedic timing and Jule Styne's score cannot be denied. Dean Martin is an amiable leading man. Charming! 1963 The Courtship of Eddie's Father – the only comedy Minnelli ever directed with unbridled effervescence. Having finished the movie last night, I can't disagree with your expert analysis, although I do like it a bit better than you do. The score and the performers are so fun that the flat direction still doesn't kill it for me. It made me laugh several times, and swoon a few times for the music and the visuals. But you have a point that this is far from Minnelli's best. At least one review mentioned "the noted French corpse, Yves Montand." I enjoy the film to a certain extent-the score in lovely stereo, Gray and Keel-but the ending is a complete disaster. That Kismet score is so brilliantly sung and orchestrated that I can forgive the flat, unfeeling direction and usually enjoy watching it in the beautiful Blu-ray rendition. If only a director could have been found who wanted to have fun with this Arabian Nights fable instead of Minnelli who couldn't have been less interested in it. But, for the first song to be the dirge-like "Fate" (at least in its beginning stanzas) and cut the amiable and catchy "Rhymes Have I" was a stupid notion. Clearly, it's time for me to watch this superb Blu-ray disc again! It’s my understanding that they do not survive. Oh….That's too bad. But I guess that's true for almost all movies from before 1980.